With party season just around the corner, I thought that I'd put together a series of blog posts including a few tips and tricks along with my favourite products to make sure you're looking fabulous come Christmas time. At this time of year I think you will all know what I mean when I say that shaving can tend to go a little downhill, without tanned legs and denim shorts on a hot beach there seems to be not so much need for perfect pins. The time soon comes when enough is enough and it's time to shine with beautiful legs once again and this time paired with a little black dress or a sparkly sequinned number. 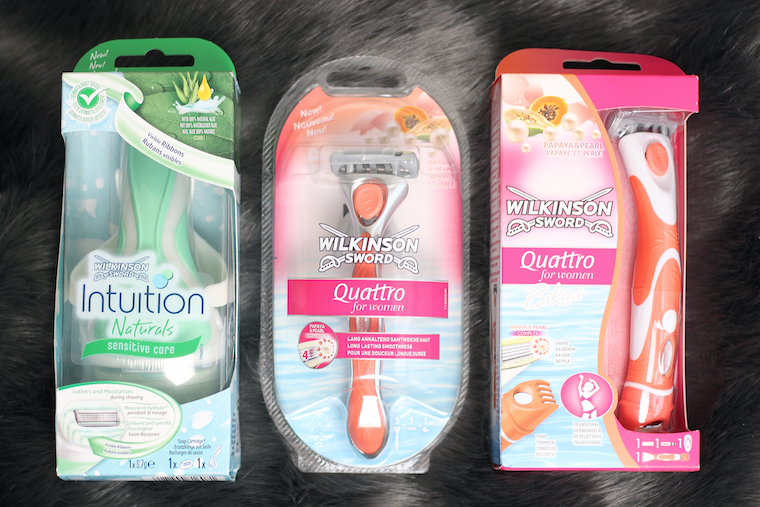 I've always preferred Wilkinson over any other brand when it comes to shaving, I find the razors to give the closest shave and that they also last much longer before needing replacing. The bikini version is genius too, it comes with a regular razor on one end and an electric trimmer on the other for that area. It's one of those products that you soon start to wonder how you ever lived without it before. If you struggle with super sensitive skin and find that shaving can often leave your skin feeling dry and damaged then give the sensitive care version a go, it's enriched with Aloe and Vitamin E so will truly take care of your skin. All of the products mentioned above are currently half price at both Superdrug and Boots in store and online, making it the best time of all to stock up. I wanna try that Wilkinson Intuition Naturals Sensitive Care one. Kinda sensitive when it comes to razors. hey i am thinking about investing more into a shaver but i couldnt decide which one to buy. the wilkinson ones sound pretty good. how long last one shaver?